One of them thar tip-off Tweets (capital T?) popped in from friend M (he who said no to sweet stuff at Starbucks) talking of a new cafe in The Swich. Like to think I'm slowly building a web of eatery informants that may one day rival Sherlock's homeless network. Worthy of a review, he questioned? Andy, fire up the Bapmobile. Having a good Friday when you can park outside Ladies That Lunch, a handful of even-numbered doors up from our destination. 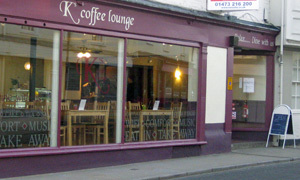 In a clearing in the Fore St stands the attractively painted K's Coffee Lounge enticing the casual passer-by to "dine with us". They're on. Loads of light and space, the odd nook, lots of wood and Anna Sparkle cushions and, with some nifty netting, enough length for indoor cricket should they wish to diversify. Open less than a week so pleasing to see other punters in here: like John Lennon said, we're not the only ones. So far, so good, and sofa for us down the far end near the heater. Pasta, salad, wraps on offer. Tuna panini for me please, Claire, and the chauffeur, being awkward, would like to order from the breakfast menu. All fine. Panini's good, with zingy balsamic-ed salad bits, and Andy enjoys his HP-doused bacon sandwich. WiFi: check, just about reaching the bowler's end, and papers too. Cake to be had, naturally: they recommended the prewrapped Honeybuns "Snowy Hills" bar, a ginger and polenta shortbread with lemon sponge. Thought it would be OK; was gorgeous, esp. between sips of strong coffee. Isn't the most obvious location down there but they're bound to attract regulars and I'll definitely be back there myself. As the ad once said, K's is captivating. If it was a car -- Dodge 400 (Chrysler K Car). If they were passing by -- Jason Kay.